Valentine's Day. Do you celebrate it? I like to keep it simple with small gestures of affection. A nice home cooked meal with a yummy dessert to follow. The boys usually surprise me with multiple bouquets of flowers which I adore. 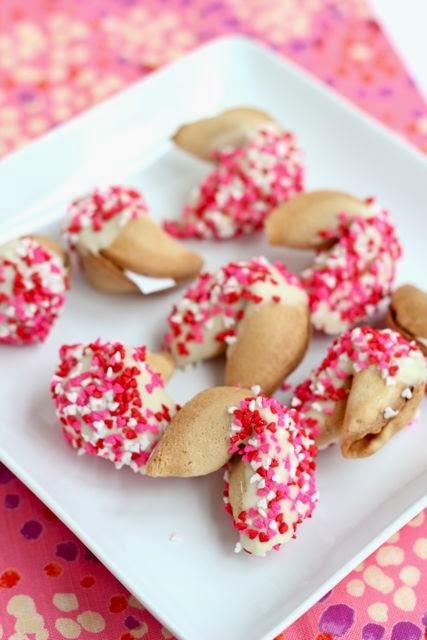 I wanted to surprise them with a special treat so I dipped some plain fortune cookies in white chocolate and covered them with Valentine's Day sprinkles. 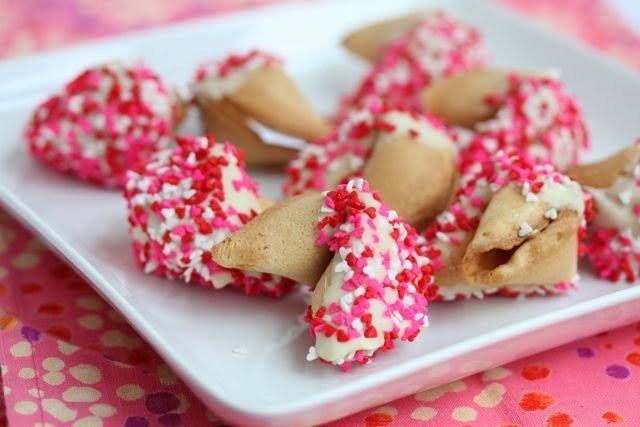 Fortune cookies are so much fun but to be honest, they're a little on the boring side when it comes to taste. Not anymore, thanks to a little dunk and sprinkle. 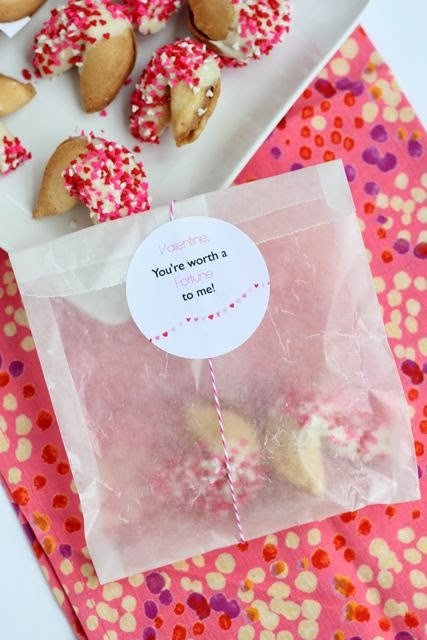 After the chocolate had set, I packaged them up in some Glassine Wax Paper Bags , wrapped them with twine and sealed them with stickers on which I printed, "Valentine, you're worth a fortune to me!" Who knows what mysterious message lies inside. I think these would also be really fun to give to friends and coworkers. Who doesn't love a little good fortune? 1. Unwrap the cookies. Line a cookie sheet with wax paper. Then melt the chocolate in the microwave, according to package directions. 2. Holding one side of the cookie, dip the opposite end being sure to let all excess drip back into the bowl. This keeps the chocolate from dripping down into the cookie and ruining the fortune. 3. Then, while the chocolate is still wet, cover with sprinkles. Set aside on the wax lined cookie tray. Place in the refrigerator and allow the chocolate to set for at least 20 minutes. Store in air tight container until ready to eat. These are adorable!! Love the idea to dress them up for the holiday :) I made homemade fortune cookies once for a dinner party long, long, ago. It was so much fun to write the fortunes to go inside. 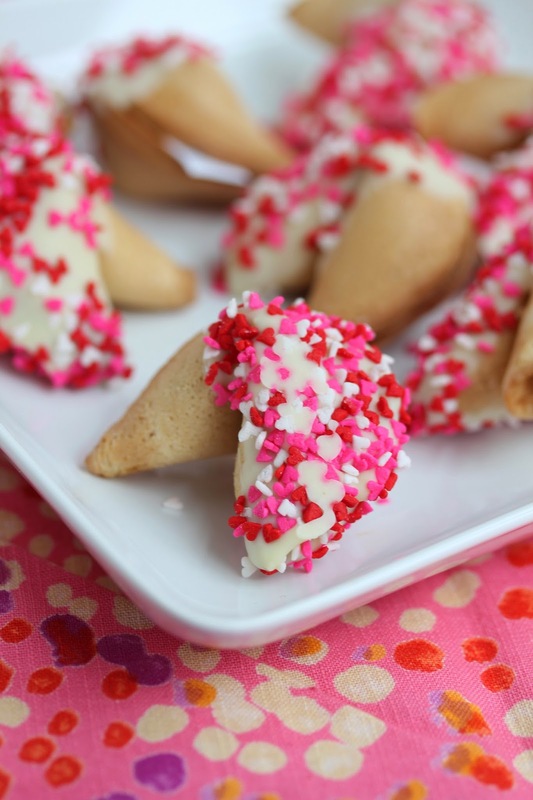 I thought about doing homemade but that was a little ambitious for my baking skills :) I do love the idea of customizing the fortunes though! These are so adorable! Your pictures are super gorgeous as well. What kind of camera do you use? I love the photos! These are adorable and I'm totally going to try this.